We often find ourselves in picturesque spotsA� without a good camera, or worse, not having someone to click a good picture of us. Besides, some people like to enjoy their holiday without a heavy camera around. Thata��s where Dass Kishore steps in. An IT graduate from the city, Kishore became interested in photography after his grandfather started a studio 20 years ago. 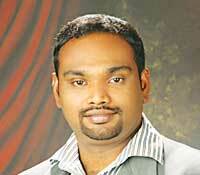 Freelancing initially, he soon quit his job to start Blessed Studio in Saligramam, last October. And he was keen to do something different. a�?Any studio can provide wedding photography. I wanted to do something unique and thata��s when I thought of holiday photography,a�? says Kishore. As a result of some advertising in Ooty, Vijaymala, a housewife who was holidaying in the hill station with her family, hired his services. a�?It was different, but fun. We forgot to carry our cameras and luckily thata��s when we came across this. Kishore joined us and our pictures were taken,a�? she recalls. With a team of 10 working with him (they use Canon DSLRs with a host of lenses) and packages targeting various budgets, customers make bookings about 15 days before their trip. Their packages start from Rs 5,500 plus service tax, with 180 images delivered on a CD. Kishorea��s charges are inclusive of an eight-hour session, and customers do not have to pay extra for travel or accommodation for the photographer. a�?We do not encourage our customers to print photos in order to be eco-friendly. But thanks to social networking sites, people only ask for soft copies. If they insist, we print at Rs 3,500 for an album.a�? The team is open to shooting at any place in South India, especially hill stations like Ooty and Kodaikanal. Rta Kapur Chishti brings 108 sari drapes to Chennai!